Bill researching and trying a new recipe. We are always looking for inspiration online. Some of my earliest memories are climbing on to a chair in the kitchen and trying to help my dad cook, Often times, dad would shoo me out of the kitchen, mostly afraid I would cut myself with a knife or burn myself on the stove. I still have scars to prove I did both! Dad and I: We still used dad's 1976 Kitchen Aid mixer. I like to thing the mixer is like an old house - storing all the memories within the walls. I find comfort in knowing every single time my dad used the mixer he was making something for my mom and I - all with love. The short answer: To honor those we love. My father loved to bake. When I would come home from college for the holidays or from Tampa for vacation, dad always had a fresh batch of brownies waiting for me when I walked in the door. Often times, on nights before I would leave, dad would be up late baking more brownies, peanut butter or chocolate chip cookies. He would secretly slip them into my carry on bag and I would often find them when I arrived back home. 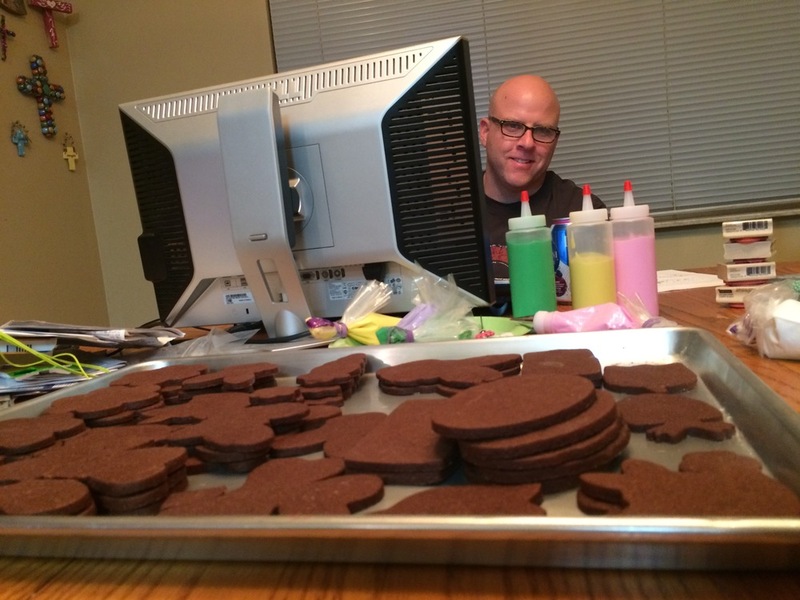 Dad's love for baking didn't stop when he was diagnosed with cancer. Even up until a week before we made the difficult decision to put dad in hospice, he was still trying to bake brownies for us to take back to Tampa. Barely able to stand up, leaning on his walker or sitting in his wheelchair, dad gave my husband, Bill, directions to bake brownies. Baking at my parent’s house in Texas stopped when cancer stole dad’s last breath on December 21, 2013. In 2014, as a way to honor my dad and those we lost in 2013, Bill and I started baking cookies for friends and colleagues at Christmastime. Every holiday tin also gets an angel in honor of our son, Wilson, who also died in 2013. Bill and I would like to think that Wilson, much like his grandpa and daddy, would be gobbling up the cookies. Slowly, we discovered our cookies were yummy, pretty and brought joy to others. We hope that in our grief, these cookies make people smile. Please contact us for all of your custom cookie needs. We would love to work with you and make your special day even better.Our cookies are hand decorated, hand crafted, one-of-a-kind, artisan sugar cookies, baked with love in a home kitchen under the Florida Cottage Industry law. Contact us for prices and ordering information.